"Your structure was instrumental in getting me as fit as possible with not a lot of time to do so. No doubt I am a stronger, smarter and all around better athlete having worked with you." At Macy Endurance Coaching, we do one thing: comprehensive, personally-tailored endurance coaching. We don’t believe in cookie cutter training plans, startup fees, or counting emails and phone calls; our work isn’t cheap because we don’t provide a cheap product. We’re experienced, elite athletes with years of teaching and coaching under our belts, and we take pride in working with you as teammates in your athletic and personal development. Welcome to going big. Welcome to Macy Endurance Coaching. 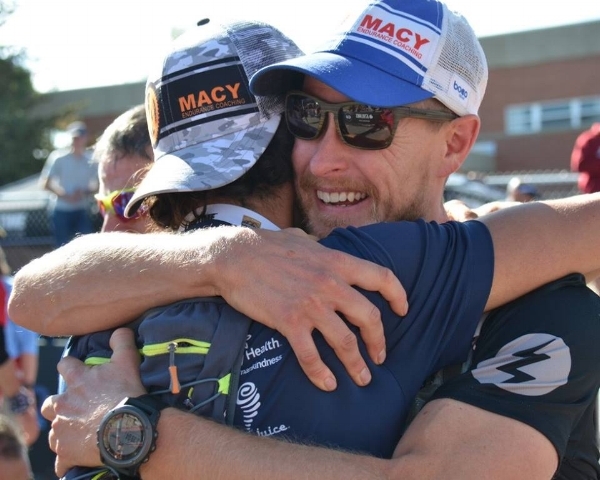 Finisher of over 120 ultra endurance events in 17 countries, Travis Macy, M.Ed., is a speaker, author, coach, and professional endurance athlete. He is the author of The Ultra Mindset: An Endurance Champion's 8 Core Principles for Success in Business, Sports, and Life, and he set a record for Leadman, an epic endurance event consisting of a trail running marathon, 50-mile mountain bike race, Leadville 100 Mountain Bike Race, 10k road run, and Leadville 100 Run, all above 10,200' in the Rocky Mountains. Travis lives with his wife and two young children in the mountains around Evergreen, Colorado. His sponsors include Vasque Footwear, the adrenalin project, injinji, Ulimate Direction, AYUP Lights, Vespa, Native Eyewear, Hagan Ski Mountaineering, and Northern Lites Snowshoes. Travis is certified by USA Track and Field and National Federation of State High School Associations and has coached numerous 100-mile (and other ultra distance) finishers, a Leadman winner, an Adventure Racing World Championship second place finisher, a Ski Mountaineering National Championship podium finisher, and many others who seek age group victories or just want to beat the cutoffs. Brandy Erholtz, M.Ed., is one of the top mountain runners in America. In 2008, Brandy narrowly missed qualifying for the Olympic Marathon Trials. Instead she went on to win Mt. Washington and become a US Mountain Running Champion. Since then she represented the US in 13 different international competitions, won Pikes Peak Ascent (x2), won Mountain Washington Road Race (x2), became Long Distance World Mountain Running Champion (2010), and won US Snowshoe National Championship (x3). A parent of two young boys, Brandy knows the unique challenges of training as a woman. She balances her running career alongside her most important roles as wife and mother. She knows that sometimes you need to squeeze your training in between a conference call, changing a diaper, and making dinner. That intimate knowledge of reality is what makes her coaching unique and perfect for many women. Brandy holds a minor in Coaching, a degree in Exercise Science, teaching licenses in Health/PE and a Master’s in Education Curriculum and Instruction. She is a USATF Certified Coach and has had many years of teaching and coaching experience. Brandy would love to help you reach your next goal, whether it is losing the baby weight, completing a 5K, marathon, your first trail/mountain race or even an ultra-marathon. Want to learn how to make training/racing work alongside parenting? Ask Brandy! "Your workouts, structure, and mindset coaching were essential in getting me to my goal." Ready to go big? Please call Travis at 720 530 4014 or examine further details here. Macy Endurance Coaching athletes Rodrigo Jimenez and Marvin Sandoval on the Leadman podium.